Avon was founded as the California Perfume Company in 1886. Their first product was the "Little Dot Perfume Set" with five fragrances: Violet, White Rose, Heliotrope, Lily-of-the-Valley, and Hyacinth. 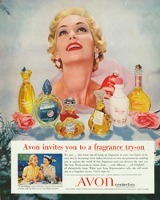 The company took the name Avon in 1939. For most of its history, Avon relied on direct or "door-to-door" sales. In the 1980s and 1990s, Avon addressed their shrinking customer base with new methods, first mail order, and later, internet sales. In the 2000s, Avon also turned to celebrity and designer names for many of their cosmetics and fragrance lines, and made a bigger investment in television and internet advertising. Avon does not launch all its fragrances in all markets. The list of new releases below includes some (but not all!) fragrances launched in the United States. Avon also owns Mark, a label geared towards younger women. See review for Avon Unforgettable (1960). 2010: Eternal Magic, Aromadisiac, U by Ungaro Fever, Windscape, Far Away Dreams, Avon + Fergie Outspoken, True Force, Pur Blanca Blossom & Bali Bliss, Hervé Léger Femme & Homme, Black Suede Leather, Ice Sheers Delicious, Luscious & Refreshing, Rare Diamonds, U by Ungaro Fever For Him, Turn4XT. From an Avon representative or the company website. See all articles on Now Smell This tagged Avon, or take a look at our collection of Avon fragrance commercials.